At Cooper, the safety of our guests and employees is of the utmost importance. That concern for safety is the deciding factor in all decisions regarding mountain access, which includes all means of uphill travel. The US National Forest Service acknowledges that ski resort operators have the ability to decide and define how ski trails and facilities can be operated, accessed, and utilized. This provides Cooper authority over land use within its Special Use Permit boundary. It is important to remember that uphill access via means other than the lifts is a privilege not a right, and thus your cooperation with Cooper Management and policies is what makes the opportunity for such activities possible. Below are a few pertinent points for all uphill access users. Please read the Terrain Access Policy for full details and information. Prior to going uphill at Cooper via means other than the lifts (skinning, hiking, snowshoeing, etc. ), you must become a Cooper Uphill Access User by visiting the Guest Services desk to sign off on the Terrain Access Policy and purchase an Uphill Access Pass which is to be on your person at all times and visible to Cooper staff when accessing the mountain from scheduled Opening Day (December 8, 2018) to scheduled Closing Day (April 7, 2019). If at any point in time you are found to be in violation of any of the guidelines and policies in Cooper’s Terrain Access Policy, your access privileges may be suspended for an indefinite period of time (this includes lift access privileges as well). Uphill Access Passes are available to Cooper Season Pass Holders at no charge; Uphill Access Passes are available for purchase to all others at $20 and are valid for the entire 18-19 operating season. 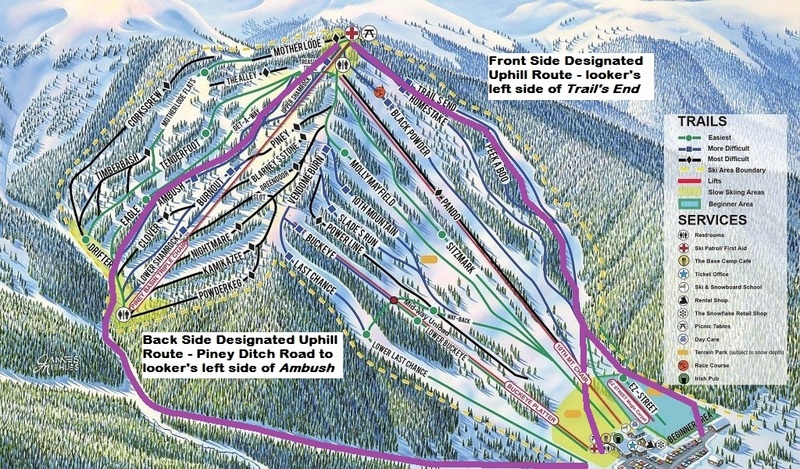 Uphill Access Users are considered “skiers” under the Colorado Ski Safety Act. You are responsible for your own safety at all times while at Cooper. 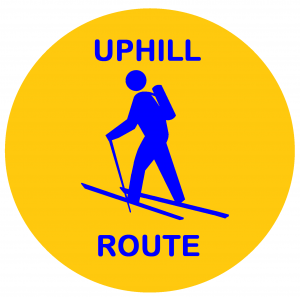 From 9am to 5pm, there are 2 designated uphill routes (one on the front side of the mountain and one on the back side). These two designated routes are the only ways uphill from 9am to 5pm. Looker’s left of Trail’s End is the front side uphill route, and looker’s left of Ambush is the back side uphill route. See the map below for a visual, and follow the yellow and blue Uphill Route signs as you go. If a trail that is a designated uphill access route is closed for any reason, or due to events on the mountain, the uphill route may be moved to another trail. For example, on a big race day, the front side uphill route may be moved to either Molly Mayfield or Pando, depending on where the race is taking place. Look for the yellow uphill signs and follow them. From 5pm to 9am (overnight), uphill access is allowed on all trails except those that are closed and those on which grooming operations are taking place (see the night’s grooming plan and trail report located on the north side of the lodge next to the exterior First Aid Room door – we try to update it every evening, but cannot guarantee this). You may not enter closed trails or areas at any time. It is your responsibility to find out which trails and areas, if any, are closed, before embarking on your journey. Your access privileges will be suspended indefinitely if you are found on a closed trail or area. A valid lift ticket or season pass is required for riding all lifts; attempting to do so without one will result in the loss of all access privileges and theft of services charges. Dogs are prohibited on the mountain and in the base area 24 hours per day, 7 days per week from November 15th to April 15th every year. Baby carrier packs attached to one’s person, either on the back or on the chest, are prohibited at all times on the mountain. Pull-behind ski strollers are permitted.